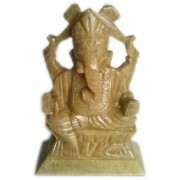 MYSTIFYING MARBLE GOD-GODDESS STATUESDimension: Ganesha- H-4 Inches Approx. The real charm..
Dimension: Ganesha- H-4 Inches Approx. The real charm of objectifying God - the supernatural - lies in representing it through Natural means only. Following the Age old proven tradition, we are offering you the meticulously crafted Marble / Stone statues of different God / Goddesses. These Statues are remarkable for their elegance and beauty and their mystifying aesthetic appeal assures the eternal peace and enhance one’s sense of reverence. Perfect for keeping in temple, one’s home temple, in the drawing room or in office room as well.